Josh is ever the early adopter. He’s the perpetual volunteer technology guinea pig, especially where iDevices and Apple operating systems are concerned. Most times the only consequences he has to endure for his enthusiasm are a couple of “restores from backup” or maybe a total factory reset. Other times he ends up with no skin. Still, I bet he enjoyed that new panorama feature in iOS 6 at least once or twice before he was flayed. 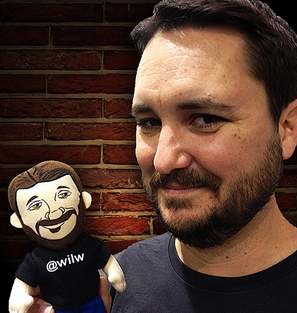 If you ordered the Lil’ Wil plushie, the order page has been updated with an estimated delivery date (to us) of November. Once they’re in hand, they’ll start shipping from Blind Ferret out to you. 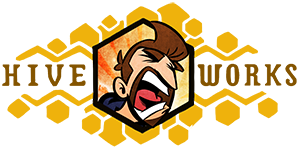 Speaking of Blind Ferret and Wil Wheaton, they’re all at Montreal Comiccon this weekend. You can find my shirts and books at the Blind Ferret Booth (506 and 508). If sales are good when I’m not even there, I might try to come to the show next year. Canada is always incredibly expensive to get to (from Texas) and to stay in, but it’s also always a blast. COMMENTERS: Are you a firmware hacker, a jailbreaker a boot loader or a rom flasher? Or are you a skittish software installer like me who waits for the OS cookies to be fully baked and cooled before biting into them? Any particular triumphs or horror stories? Back in the days of dumb phones when dumb phones were JUST starting to get smarter I had a Symbian OS Nokia. It was the first phone I’d ever even held that you could install apps on. I think they were all java apps that random dudes coded in their basements and uploaded to usenet, but they were MORE than what I paid for which was neat. The phone also shared the same internals as the Nokia N-gage (Taco Talkin’ Time! ), so I was able to load 1 or 2 N-gage games at a time onto the flash card. Games that were impossible to play without a proper D-pad. Still, it was pretty neat. Posted in Uncategorized and tagged apple, ios, ios 6, iphone, iphone 5, josh dies, tech. Mother of science! The last time it felt this bad to be touched was after spending forty seconds in direct sunlight. Eli looks about as confused about the fact that the belly-button is still attached as I am. Part of me suspects it's a very subtle reference to Jeepers Creepers. The rest of me is embarrassed that part of me came up with that theory. He's not. He's poking the eyeball. Why is Josh always the one who gets horribly but hilariously mutilated? Josh is the Kenny of Hijinks. I suspect that's because real-life Josh probably keeps doing things to make Joel want to do such things to him. Although I'm probably wrong and RL-Josh finds it hilarious. Early on it was a "See what I did to you!? AHAHAHAHAH!" type of thing. Then it just became a thing. Then it stopped being a thing for a long time. This is the first one Ive done where he dies in years. Aaaand now I know what you mean by "most disturbing panel ever." Suddenly thinking I'll just skip lunch. Are we sure it's malware, and not an iOS feature? I guess it all depends on how they spin it. "Siri, rip all my skin off." "Can any other phone do that?" See this? This is what happens when you don't read the "Terms and Conditions" when you update/download stuff. Granted the "may be flayed alive" section is pretty close to the bottom, but they put that stuff in there for a reason people. Where we're going we don't need eyes to see. And to think… I hesitated. Way to hold the phone wrong, Josh! I'm too stubborn to be all rooting and flashing. I figure I paid enough for the thing, it sure as hell better get updates and the updates had better be good. Also, most rooting and flashing seems to require a Windows machine, so… so much for Android x MacBook. You needed to have the iPhone making chittering and hissing noises while it was up on the wall. Speaking of flashing, I just flashed back to the movie Runaway. I've dabbled into stuff like that. I unfortunately updated my Tmobile Galaxy SII to ICS, and had to find a way back to Gingerbread. Then there was the FlatPad, which still doesn't work after updating the firmware. "Limp, the body of Josh hung from the pink palette; unsupported hanging high above us in the computer chamber; and it did not shiver in the chill, oily breeze that blew eternally through the main cavern…"
… thanks for the nightmares. 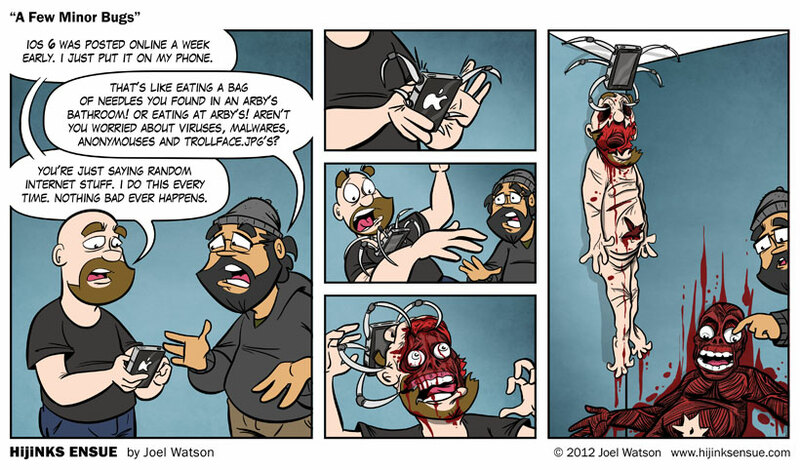 This is actually been my fear of downloading apps onto my HTC Android phone. Apps? Whassat? I still haven't upgraded my Stone Age-era "feature phone". It can use Java-based apps, but that's about all. I refer to it as a GED phone. Not quite smart. No offense intended for you delightful people that bounced out of high school early. My favorite line in Hellraiser is between Larry and daughter Kirsty as they chat in the kitchen doorway. "Bla bla bla plot points bla. I'll try to be nice to creepy step-mom. I'll make some tea." "Great idea. There's the kitchen." It's obviously a special movie in my heart. That is just repulsive. I did NOT need the image of wet mounds of putrid, seeping flesh. Please never mention Arby's again. I don't know about any of this "wiresless" half-eaten fruit hand-held devices. I just know I really, really, really, really, really, really, really HATE having to be the one who teaches my mom how to use a smartphone. Simply because I'm the only one patient enough to listen to her unending nonsensical questions and even more ridiculous "theories" of why X keeps happening. huzzah! The return of the "josh dies" tag! Oh, how your pain and humiliation amuses us.